Since a couple of months Armourfast has become a stand-alone company (whereas previously it used to be under the umbrella of Hät). 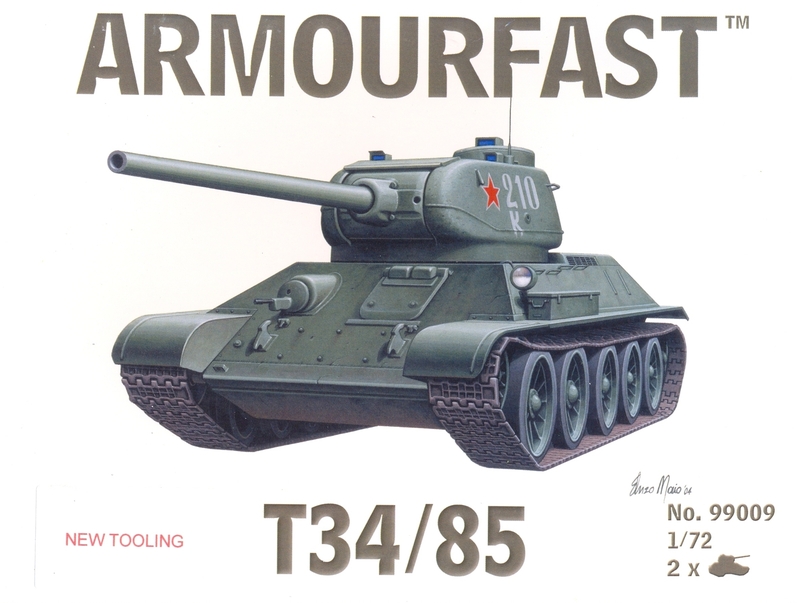 I don't know if there is a link to that change, but the latest edition of the Armourfast T-34/85 kit has been substantially reworked and is now dimensionally far more accurate than it used to be (although still with some issues, as we will see below). Detail has been improved at the same time. Pictures of the first release can be found at the HenkofHolland website. 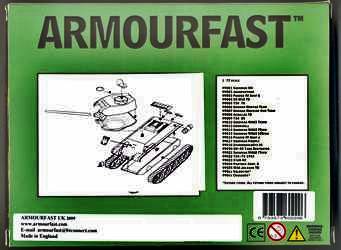 It still is a very simple kit however, tailored for the wargaming community, and this is not surprising, given the name "Armourfast". As we can see in the scans below, the original version used to be even simpler. Left: the rear of the box for the retooled kit showing the sticker with the manual for the retooled kit. 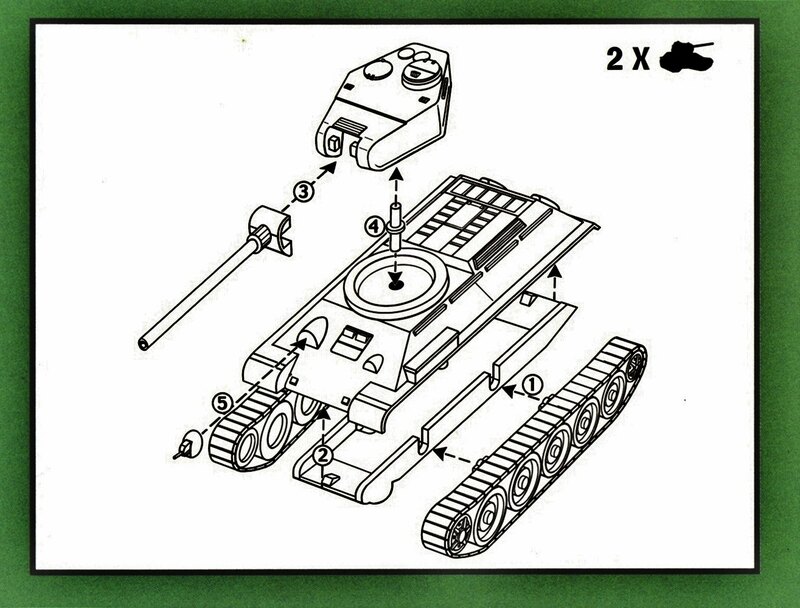 Right: the instructions of the original kit, found below the sticker on the back. It is obvious that the earlier release was much simpler. The green plastic in this kit is quite soft; something in between the usual styrene and vinyl, which is slightly annoying when sanding or scoring. The plastic reacts very well to MEK however, but paint adherence is low. The hull is a two piece affair, to which the, MG mount, rear engine deck, exhausts, fuel drums and driver's hatch have to be added. (The hull is solid underneath the latter, by the way.) These fuel drums actually took me more time to assemble than the remainder of the kit, as they are split lengthwise; the resulting seam at the ends is quite difficult to fill without damaging the parts. Apart from this, I also believe that most T-34/85 had three of these barrels, not two as you get in the kit. The rear engine hatch is situated a tad too low, by the way. The sponsons are open underneath, but you will not see much once the tracks are installed, partially because they are installed far too close to the sponsons if you follow the kit lay-out. I chose to build the kit OOB, but installing the tracks a bit further away (vertically that is) from the hull won't be difficult. The tracks are not quite foolproof, so be sure you get the idler in front and the drive sprocket at the rear. The only casting flaw I found in the kit was on these tracks. One of them has an annoying sink mark at the front end. 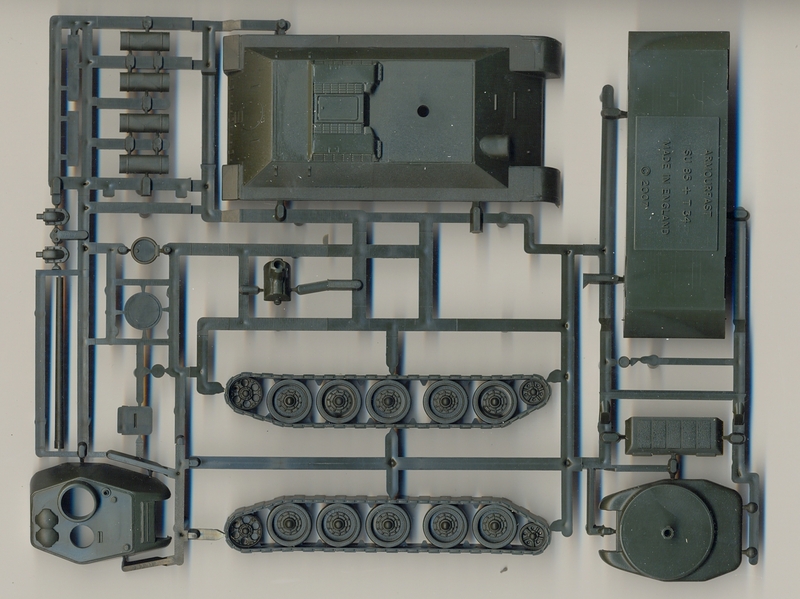 It's not that difficult to fix, as these tracks are very simple representations of what was found on the real tank. Actually, I can live with the simplifications made by Armourfast to cater for the wargaming community, but the simplicity of these tracks is, in my eyes, one step too far. 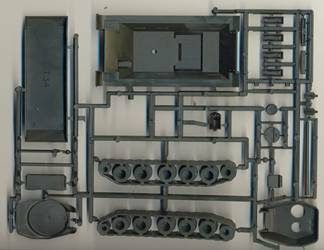 Giving them just that little bit more detail wouldn't make assembly any more difficult, the finished kit any less sturdy, but would give something that would come close to the simplest of display models. The turret comes in two main parts, with a two part gun assembly. The gun is off-set (a bit too far in my opinion) and the engineering of the kit is such that you cannot install it the wrong way around. 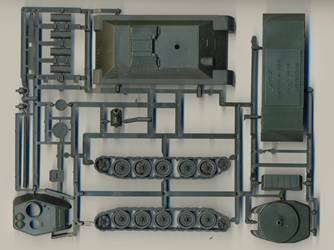 The commander's hatch is a separate piece, and if you cut it along the hinge, you can build the turret with the hatch open. (You'd better fill the opening with a crew figure, as the inside of the turret is empty.) Installation of this hatch is not fool proof, so make sure you get the short "half" in front, and the hinge lined up (as I didn't...). Likewise, the gunner's hatch can be opened up too. In all the turret is not a bad representation of the real deal. After assembly, which takes about 10 minutes (including cleaning up the parts, but excluding fixing the seam on the fuel tanks), you still have some sort of toolbox left for your spare's box. I took the time to measure the kits against plans in  and  (which differ quite a lot between them) and found that the hull is slightly oversize, being close to 1/68. The turret, on the other hand, is a bit too small, coming closer to 1/75. As the sides of the hull have a slightly exaggerated slope, the relative difference in size between turret and hull is not readily discernable. 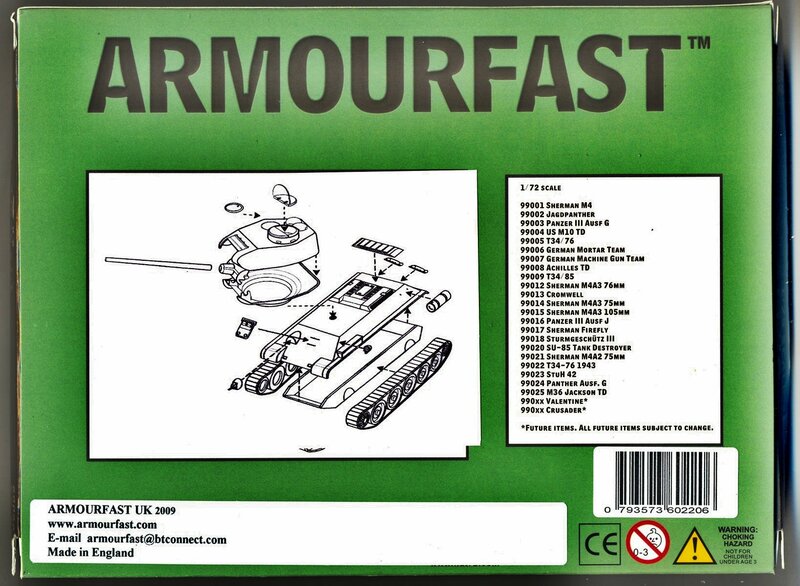 PS: note that you get two identical kits in one box, as is customary with Armourfast kits. 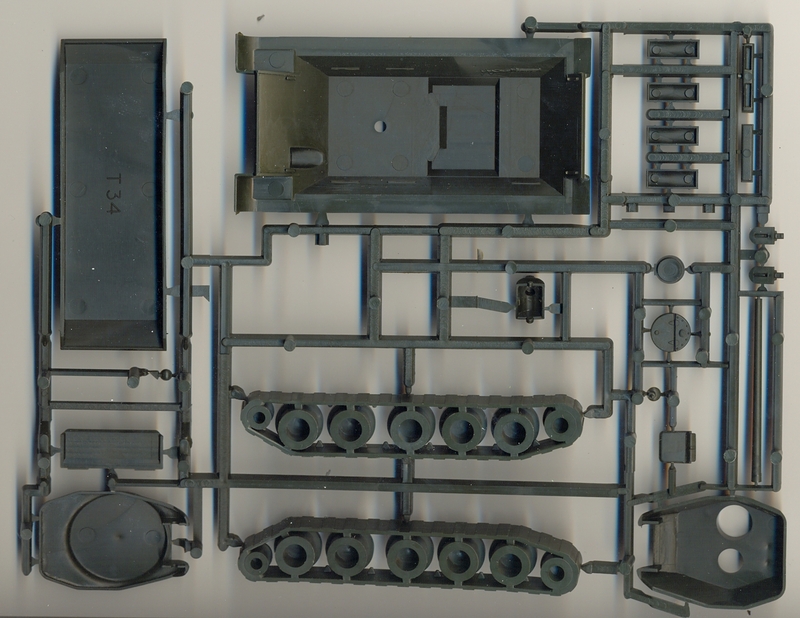 Below are pictures of the kit, after construction and with a coat of grey primer. 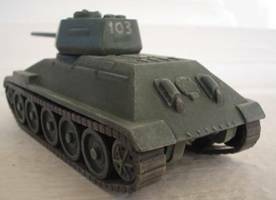 I still haven't decided on a camouflage scheme, but it will either be 4BO or Russian Tank Green. Below are pictures of the earlier release. I believe the pictures speak for themselves. Pictures from Henk of Holland website, used with permission. Higher resolution pictures can be found here. Sample kindly procided by Armourfast.